Challenge your friends now at Scopa the only one with SCOPONE SCIENTIFICO mode! Download the most complete Scopa game, the only one with MILLION of PLAYERS and with many game modes, prizes and bets, choice of players, LANDSCAPE and PORTRAIT graphics, online matches ...and much more! Play online without registration, or sign in with Facebook! • ONLINE Matches (Wi-Fi or 4G): Play with your friends at incredible challenges! You can login with Facebook/Google+ or play as a guest, you do not have to register! • CHOOSE the match: decide whether to start a game for 2 or try SCOPONE SCIENTIFICO! • The more you risk, the more you WIN: choose how much to bet and win the jackpot! • WITHOUT CONNECTION? No problem: while you wait for your connection to resume, PRACTICE offline against the CPU and win coins! • SPECIAL EVENTS: get ready to participate at special events with unbelievable jackpots and dedicated leaderboards. Beat your opponents and show them who’s the CHAMPION! • SOCIAL: how many friends do you have? Add, write, chat, report, remove ... all in one section dedicated to YOUR FRIENDS! Do you like to play with a specific person? ADD HIM TO YOUR FRIEND LIST! • LEADERBOARDS, STATISTICS: Keep track of your scores and your progress. Don’t forget that practice leads to perfection! • ACHIEVEMENTS: More than 100 goals to reach, will you be able to unlock them all? • 11 DECKS of different regional cards! ... and if you don’t like game as it is ..customize it through the many available SETTINGS! 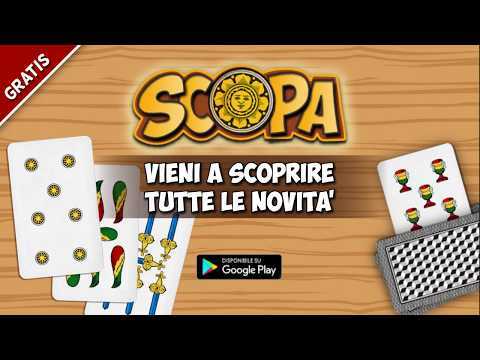 Scopa is one of the most popular card games in Italy and has millions of players around the world. For any doubt, advice or error, please feel free to contact us at: help@whatwapp.com. WARNING: This game doesn't offer "real money gambling" or an opportunity to win real money or prizes, and that practice or success at social gaming doesn't imply future success at “real money gambling". * Create a challenge with Asso Pigliatutto, Rebello and/or Napola rules within your team! * Invite a friend to join your team! * New team chest available soon! Enjoy the Christmas holidays playing the classic Italian Bingo! Play with your friends and call "TOMBOLA"
Fixed Facebook login and app loading problems. * New special event with a special table! • Enjoy the new summer meta-game: GUESS THE WORD! * Fixed the issue where single-player matches were not working when offline. * Fixed the issue where sometimes daily missions would not be counted correctly. * New feature: challenge yourself with the new daily missions! * New special event starting on 25th of April! Find out what it is! * There's a new feature waiting for you: find out all about the new Piggy Bank! * New leagues feature: get BOOSTERS to stay in your current league or be promoted to the next... have you ever been in the GOLD LEAGUE? * Reduce waiting times: watch a short video and open your free chest ahead of time! The all new Easter Event will be live in a few days: get ready! * New "FREE" section: now you have some new ways to get free coins and tokens! * HALLOWEEN SPECIAL EVENT: will start on 10/26* New notifications that highlight what's new for you to discover!